In most classes, we serve assorted fresh teas, fresh fruit, infused waters, and hors' dourves. What we will have is based on the season and what we are currently growing. In all classes, you will leave with something that pertains to the class (EX - canning jam - a can of jam). Unless stated below, classes are $25/person. Unless otherwise stated below, classes are for adults only. We do offer seperate classes for children. We want everyone to get the full experience without distractions and request the same consideration from and for all other guests. Children must be accompanied by an adult for all kid's classes. Kids of all ages are invited to attend our kids' classes, but please consider the material of the class before signing your child up. Make sure to sign up for classes ASAP as space is limited. Fill out the Online Events Registration Form to sign up. If any class is not at least 75% full, we reserve the right to cancel the class. Should a class be cancelled, you will be notified by the email address on your event registration at least 24 hours prior to the class. We will do our best to reschedule. If you need to cancel your class resevation, we require at least a 2 week notice in order to offer a refund. Refunds can not be made for cancellations made less than 2 weeks before class or no shows. We do this so that we can offer your spot in the class to someone else. CSA: what it means, what it does, and how it works. This is a free class to anyone who would like to come out. In this class we explain what CSA stands for....what it means...how it is done...how we do it here at our farm...and any other questions any one might have. We will also have CSA baskets available to anyone who would like to take one home. Information on our CSA will be available to take home with you. You can sign up any time during the seasons. 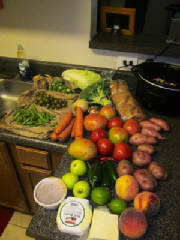 What will be in this weeks CSA will be based on what is avaialbe that week. You will have a tour of this farm and see how everything is grown. This is a great way to learn about hydroponic farming and what this farm does as well as what a CSA program is and how they work. A farm to table lunch will be served this day as well. The lunch is $15.00 and includes tea or infused water and dessert. Please let us know if you will be staying for lunch to ensure enough lunch is prepared. 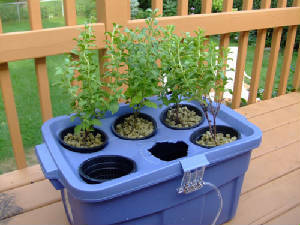 Hydroponic Gardening as well as Aquaponic Gardening. Anyone can grow your own fruits and veggies. No matter where you live. No matter how you live. Its better for you and its cheaper in the long run. And even better...ITS FUN!!! In this class we will show you different way to make your own hydroponic systems. Abd inexpensive ways of making them as well. And aquaponics is something few know much about. But its so easy and so much fun! Get the kids involved....learn how to help them ..by teaching them how to help themselves. Everyone needs to know how to grow their own food and doing it thru hydroponic means is so easy! We also have retail systems you can purchase and we can even install them for you or teach you how to do it. REMEMBER....it is simple!!! I have to keep saying that because this GROWING YOUR OWN FOOD tends to scare people. Dont let it. We will help you learn what to grow in them..what grows best in them, how to plant a whole salad together and how to tend your hydroponic garden. Aquaponic systems can be big or small. But once you get started you will grow your own project. And the end result is you will have fish and veggies to eat! Refreshments will be served before class begins and as in all our classes you will take something home with you. Bring your note book as we will introudce you to alot of new things. We will have extra helpers there to help answer questions. Herb Gardening and Container Gardening. No matter how small of a space, you can always grow your own food. This is what we help teach you with conatiner gardening. 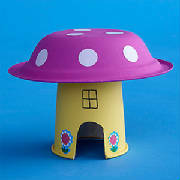 You can even grow inside your home or on your porch or balcony. Herbs are wonderful to cook with and they are so good for you. They are really easy to grow and it helps to know what grows best planted by what. This class is to teach how to grow in small places with containers....how to grow herbs as well as using herbs as companion planting with your vegetables. 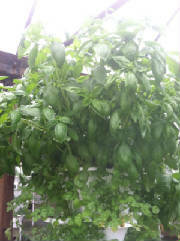 You will also get to sample foods we grew in containers and paired with fresh herbs. This is a wonderful class! We LOVE to can! And freeze. It is so much heathier than eating store bought with all the preservitivies. Whats the saying...the longer the shelf life, the shorter yours! It fits!!!! Making jam is one of the easiest We hope to have time to go over canning methods and also can another jam...like blueberries . I should still have some in the freezer. From start to finish we will go thru every step and teach you just how easy it is. Once you get started you will want to can everything! With spring and summer coming you should learn now how to can so you can take advantage of all the fresh fruits and veggies when they start coming in. Or if you to opt for our community gardening , then YOU will have your own fruits and veggies to can yourself and as with most of our classes we will have something you will take home at the end of the class. 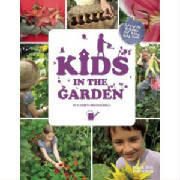 Kids Gardening....this class is for all kids. But with smaller children(4 and under) we ask that parents stay with their child throughout the class. We will teach kids how they can plant their own foods to eat. How easy it is and how much fun it can be. A $5 discount will be given to each additional child of one family for Kids Gardening Class. At the end of class the kids will have something they can take home with them. Normally it will be something they planted in a pot. This is to give them something to take care of and so that they can talk to you parents about thow they did and the experience they got from it. We will also cook at the the last class with things that they have helped grow. It is a wonderful experience for the children and they come away with a much deeper appreciation of where the foods they eat come from. A Farm To Table Lunch will be held this day as well. The cost for lunch is adults $15 and children $7. No charge for children 3 and under eating with the parent. Please also let us know when signing up for this class if you plan to attend our lunch so that we can ensure enough food is prepared. In this class we will go over canning and freezing. We will be canning something and once you sign up for this class please tell us what you are interested in learning how to can. We will go thru each step of the canning process so you can see how its done. This class will be very interesting because it is our plan to can several things during this one class. This class will be to get you educated, give you the full experince of what canning is all about and to get you ready to can from this spring and summers harvest. Refreshments will be served before class begins and you will take home something canned. PLEASE READ FULLY TO KNOW ALL THIS CLASS WILL ENTELL!!!!!!!!! 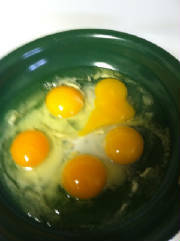 Backyard Chickens (eggs & meat). This class is for anyone and everyone. Children of all ages are welcome, but under 5 must have parent with them. But PLEASE take note, in this class we will be dressing out a chicken..processing one. This means we will show you how to HUMAINLY kill a chicken and how to defeather it, and clean it. This is not something all young children need to see. We ask the parents to decide if they want their child to learn this process...HOWEVER....the final decision as to us premitting any child to take part in this part of the class will SOLELY but up to us!!! We will have someone take the children who are either too young and not mature enough for this part of the class (parents can stay and watch if you want), but these children will be taken to another part of the farm to visit with some of our farm animals til this part is finished. Some may find this not a nice experince, but I guarentee you it will not give you nightmares. This is a part of life and something evereyone needs to know how to do. We wont make anyone watch this. Anyone who is not comfortable with this part of the class is welcome to take a break and go with the children to see the farm animals. It is up to the parent , for you to choose to allow your child to watch this part of the class. BUT, that being said, if we feel that any child will be emotional harmed by watching this, we will ask the parent to allow that child to go with the other children to see the farm animals. It is your child, but it is our class. This is something I have done all my life and started at a very early age. For children who are not use to this part of life, it might be a good idea to let them wait another year or so. In this class we will go thru each step from hatching chickens, allowing the momma to sit and hatch, caring for a new chick and all the way thru laying eggs or dressing out. Different chickens serve different purposes. We will teach you the difference. If your interested in having your own chickens, we will teach you how to build your own chicken house, coop and laying boxes. Health care is VERY important in farm animals. Especially those who serve the purpose of meat or eggs. Its alot to learn so bring your notebook, but we will also have material for you to take home with you. Refreshments will be served before class begins and as with all of our classes you will take something home with you. one of the best and most important things you can do for your family this summer!!! Learn how to can and freeze tomatoes. You use them all the time. 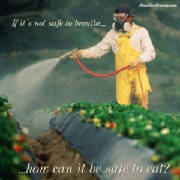 Why not can your own and STOP buying store bought which is full of GMO and preservitivites. REMEMBER....the longer the shelf live, the shorter YOURS!!!! In this class we will teach you the different tomatoes we grow and use for canning and why. Did you know one kind of tomatoe is better for sauces than others? Do you know what kind of tomatoe that is? Canning is not hard but it is important to learn to can THE PROPER way! If you do not can correctly your canned food item will ruin or even worse, make someone sick. But once you KNOW how to can, its all a matter of knowing what to can! We will take you thru every step of canning tomatoes. From coming in to the greenhouses and seeing all the varieties and how they are grown, to knowing how to pick, wash and prepare your tomatoes for canning. And REMEMBER...canning is easy! So DONT let it scare you! Come and learn how to can, then you will be ready to can all summer long! And trust me ... once you learn HOW...you will WANT TO!!!! Refreshments served before class begins...and as with all our classes you will take something home with you! .Who doesnt love the smell of fresh baked bread? Does the thought of trying to make and then bake fresh bread just scare you? Well, it doesnt have to. There are many many MANY ways to make and bake bread! 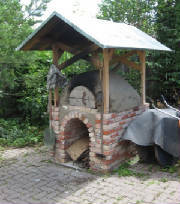 Ever heard of a cob oven? Once you see mine...and see how easy it is to actually bake in it...you will make your husband build you one. 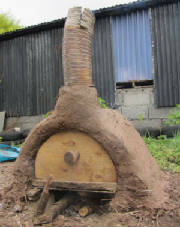 (Its ok...they can come over and Jimmy will show them ours and teach them...it is SOOO easy to make a cob oven.) You can also bake a pizza in one. It will be your best friend at cook outs. let your husband have the grill...you will have a cob oven!!!! Anyway...baking breads and even cinnimon rolls...it isnt all that hard. But, as with most things, it will take a little time. We will show you how to make and bake all kinds of breads. From those that take time to those that are Quick Fast and In a Hurry! As most of us always are. Baking bread for me is very relaxing. As long as I dont have to do it at 5:00 in the afternoon after working all day. But you can make bread ahead of time and freeze it. Pull it out, proof it in the frig, them pop it in the oven. Easy Peasy!!!! This class is for anyone...men and young adults...who want to learn the art of baking bread. We will teach all sorts of ways to bake, all sorts of breads to bake and even things like cinnimon rolls. Remember...your freezer is your friend!! Refreshments will be served before class begins, and as with all our classes you will take something home with you. Can you guess what it will be???? If you guessed cinnamon rolls YOU ARE CORRECT!!!! Seasons In The Sun will be offering garden plots for you and your family to work and produce your own foods. We supply the plot, plant plugs and seeds and irrigation. You must plant and work and tend the garden plot yourself. We will be on hand on certain days at certain times to help with questions and concerns. This is an all natural and organic as possible garden. No GMO seeds or plants. Friday february 21 from 10-12 and Saturday from 9-11 will be the 2 day begining for you to get started planting your plot. We will have everything need to get started. We we til in fertilizer in to the soil while getting it ready. You will have mounded up rows covered in plastic and 1 row of no plastic for seeding directly in to the soil...things such as rooted crops like carrots, beets, etc and even spinach is best done this way. We hope you bring your children and include the, in this as they need to know where their foods come from and how they are grown. Do You KNOW what this means??? It means, you grow it, or you raise it...it means not so many trips to the store...it means YOU learn HOW to take care of yourself and your family! Ever heard of the barter system? Works great! One day we will all need to know how to take care of ourselves and feed ourselves ON OUR OWN!!! Find freinds or make friends with someone who has a craft that you dont. Say...a doctor or a dentist. How about a seamstrest! If you dont know how to sew..learn! Let someone teach you and trade out with them to learn their skill. Or..let them sew for you and you raise a few chickens for them! Self Sustainability is about being (or working on becoming) self sustainable! If something happened...could you do it? We have all been thru or witnessed job loss. What happens when money is of no worth. But the veggies you are growing is! One day we will all NEED to know how to take care of ourselves. I learned it coming up. I taught my kids. Sad thing is, they tell me how many of their friends KNOW NOTHING about how to take care of themselves. They are so use to just going to the store. Mom writes a check or pulls out a credit card. Have you taught them where THAT money comes from. I learned that when my daughter wanted something and I said I couldnt buy it right now because I didnt have the money. She said "Write a check". I knew them, at 11...she needed to KNOW more than just how to grow food and raise animals for meat and eggs. I had failed to teach her about money. But our kids teach us sometimes, dont they. This class will open your eyes to so much...and to all things you need to learn yourself...then teach your children. Dont let them GROW thru life thinking chickens they eat are not the same chickens they see when they go to the zoo, for farm, or petting zoo. TEACH THEM!!! If you dont know..you learn first. Or learn with them!! How great would that be. This class will open your eyes to all the things WE at the farm take for granted...and are just second nature to us. YOU need to KNOW. YOUR KIDS NEED TO KNOW! Take the class together. So much will be taught in this class. Bring a notebook. Wear comfortable shoes. Be prepared to be amazed!!! Try to make this the year you work towards being self sustainable. Small steps...leads to getting there! Getting there is the fun of it all! This is the MOST important class we teach. It will open your eyes to all the things you really dont know but thought you did. This class will tell you what you need to learn. What you need to do and how to get to bringing your family to a more healthier life. Remember...the longer the shelf life, the shorter YOURS!!! Cancer is robbing so many of years they could have. Learn what is in the foods you are eating and feeding your family. Learn that you CAN change...and how! Baby steps..it gets you there!! Self Sustainability....its more than...growing your own foods, canning your own foods, raising your own meats....its a state of mind, and a way of life! This class will change your life....if you open yourself up to the possibilities that you NEED TO CHANGE YOUR LIFE!!!! Think about this...WHO wants to live to be 80 if your sick all the time! Self Sustainability is about making it on your own (in most ways)....but it is also about having a better state of life....and offering that to your kids and family as a whole! If you dont attend any other class this year...attend this one! Bring your whole family (discounts for families and for more than one)...bring your friends (discounts given if you bring someone). This class teaches you how to have more control over your life...not just the foods you eat! This class Is JUST THAT IMPORTANT. Pickled Snap Beans, Okra, and Other Veggies ....so many things to can. And such a short spring and summer. Lets get started. Make it a goal this year to learn how to can anything and everything. Send me a message if your coming to a certain canning class about something you want to learn to can and we will see if we can fit it in. If not plan to stay after class and I will be glad to healp you. This class is not just about pickleing but about canning veggies in general. 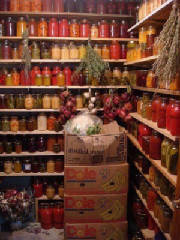 You will get to see and learn from start to finish the best way to preserve your veggies by canning methods. Freezing is another way, but there is another class on that. We will touch on freezing in this class as well. Refreshments will be served before class begins and as in all our classes you will take soemthing home with you. Bring a covered dish or 2 and bring the family.....!!!!!! peanut butter, sour cream, yogurt, infused oils, herbal tenctures, vanilla, mint extract, etc. So many different things you can make so easily and not have to ever buy them from the store again. If you have things you would love to learn how to make, send me an email when you aign up for the class and we will certainly try to high light them as well. This class is for all those who want to learn just how easy it is to make things yourself. We will cover alot of ground so bring a note book and be ready to sample some of the things we will make...I just might have some things already made for you to try....like divinity from my homemade vanilla. One batch with vanilla made from rum and another batch with vanilla made from vodka. Lets see if you can tell a difference. No refreshments served before this class as we will be sampling all sorts of things throughout the class. I will also show you just how easy it is to make infused waters and have them in you frig for the kids. Beats the heck out of soda and kool aid!!!! And they love it!! I will teach you how to make herb infused cooking pats....and freeze them for use when ever you are ready to cook. And has anyone ever made chocolate gravey before???? Over fresh pastry and fresh cut up strawberries!! OH YES!! We will make and eat in class. I am not giving you the full list...we will let it be a surprise. But I will say, if you eat breakfast...eat early. So you will have lots of room for all the great things we will make...and all the great things you will learn that day and carry back for you to do in your home! We will have lots of fun!!! Mother's Day Edition In this class kids come and get to do crafts. 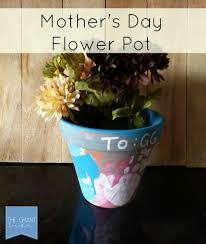 This day will be devoted to making something for Mother for Mothers Day. So please register early to ensure your space, and bring your kids out and let them make YOU something for that special day...it makes them feel special too!! They will also have time to see all our critters....and even pet a few! It will be a fun outing for them and you will enjoy yourself too. Refreshments will be served before class begins, and for you Moms we will have a special treat! And they will take what they make with them when they leave. If you want to help the environment, keep a beehive in your backyard! This class will show you how to get started having your own beehive, what to buy, how to care for a hive, and how to rob the bees. We will help you purchase equiptment. We can also help you rob the honey from your hive (the cost for us to help you rob the hive is half the honey from the hive). Anyone can grow your own fruits and veggies. No matter where you live. No matter how you live. Its better for you and its cheaper in the long run. And even better...ITS FUN!!! In this class we will show you different way to make your own hydroponic systems. Abd inexpensive ways of making them as well. And aquaponics is something few know much about. But its so easy and so much fun! Get the kids involved....learn how to help them ..by teaching them how to help themselves. Everyone needs to know how to grow their own food and doing it thru hydroponic means is so easy! We also have retail systems you can purchase and we can even install them for you or teach you how to do it. REMEMBER....it is simple!!! I have to keep saying that because this GROWING YOUR OWN FOOD tends to scare people. Dont let it. We will help you learn what to grow in them..what grows best in them, how to plant a whole salad together and how to tend your hydroponic garden. Aquaponi systems can be big or small. But once you get started you will grow your own project. And the end result is you will have fish and veggies to eat! Refreshments will be served before class begins and as in all our classes you will take something home with you. Bring your noted book as we will introudce you to alot of new things. We will have extra helpers there to help answer questions. In this class we will go over ways of making your own bath and body products. From soap to shampoo and conditioner. As well as bath salts, milk baths, facila scrubs and more. If you can use it on your body, we can show you how to make it from all natural ingredients. Avacado facial mask....citurs and mango facial scrub as well as a coffee facial scrub. Honey and lemon facial wash and so much more!!! Even bath fizzes...and they are so much fun and make your body feel so good when you get out! So bring your girlfriend, bring your sister, bring your mom or bring your neighbor. Heck, bring your husband or boyfriend if you like. We encourage everyone to come learn how to make all the things you have been buying at the store. Did you know you can make your own mascara too?? YEP!! Why keep paying high prices for things you can make at home and it will be so much better for you. Get a group together and have each person make one thing that week. Then you all share what each other has made. You end up making 1 product and getting so many more by sharing!!! And its fun! And these products are so much better for your skin! STOP buying that expensive lotion...you can make your own!!! It is simple, easy...and you will love it on your skin! If you buy it in the store...you can make it at home! This is going to be a fun day!! Refreshments served before class begins and as always at the end of class you get to take something home with you. Mimossas served as well as bloody marys! In this class we will go over both freezing and canning and tell you why some fruits and veggies work better one way while another works better the other. In this class we will show you how to process foods that you will freeze and why they need to be treated the different ways they are. Each fruit or vegetable has a different way it must be handled. Some are the same but in one way or another they are usually some differences. Bring a notebook and be ready to take notes. If there is a certain fruit or vegetable that you are wanting to learn how to can and or freeze, send us a message when you register and we will try to get that fruit or veggie in to this class as well. You are always welcome to ask questions and if we do not go over how to can or freeze something you want to know how, then by all means, please ask. There is alot of information to go over so please dont be late as we will start right away. Refreshments will be served before class begins and as with all our classes you will be taking something home with you at the end of class. This is geared towards preschool and homeschoolers..all ages. We just ask that kids 5 and under have their parent accompany them thru out their time here. This is a tour of the farm. And education on how it works and what we do here. Parents are welcome to attend as it is very educational. The kids get to see farm animals and interact with them and see why we have them and what purpose they serve. They get to see strawberries growing as well as so many other fruits and veggies including fruit trees. We hope to have strawberries producing then as well so that they can pick some. This is a wonderful day out and the kids always have a blast. You are all welcome to bring a lunch and blanket and have lunch under the pines. This is a continueing education class for the kids who have been coming every month but if you have not came to one yet, you are more than welcome to come as there will be lots to do and lots to learn. We are letting the kids from start to finish plant and help tend and harvest and at the end of each class we make something from the bounty for them to eat...plus we have other things from the farm for them to munch on as we do provide refreshments. And as with all our classes, at the end of class you will take something home with you. If you have ever wanted to know how to can soups and make fresh salsa and so on this is the class for you. 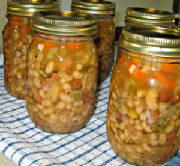 In this class we will learn how to make all kinds of soups and can them for use all year long. You will also learn how to freeze them if you prefer. And who doesnt like fresh homemade salsa....and not just the regualr tomatoe salsa....but a peach, pineapple, mango salsa.!!! Salsa with fresh fruits and veggies have so much flavor...and you cant beat it for freshness. Some of the salsas you will learn to make pair well with certain meats. And some you will want to eat over lettuce as a salad...they are just that good!!! So come hungry...bring your note book...and be ready to sample all that we make! We will be making so many different things...and you will get to sample them all! Refresments are served...but we will also be snacking thru the whole class...so bring dont come on a full stomach. And remember, as with all our classes, you will always take something home with you. Please see each month above for information on this class. Have you ever canned pickles. And I dont mean just dill pickles. Or bread and butter pickles. Have you ever made red hot pickles from red hot candies? They have to be my all time favorite. I use to make them with my Grandmother all the time. How about watermelon rine pickles. Pickles can be made in all kinds of ways with all kinds of flavors. Some take 3 days soaking in an ice chest. Some you can make in just a day. No matter how long it takes...they are always worth it. Make a point to attend this class so you can learn to make your own pickles. For hamburges...for salads or for just plain eating out of the jar. Your family will be so happy, and so proud you did! Surprise them...and learn to can this summer...and start treating them to HOMEMADE vs store bought!! Good for you and helps you too....my Daddy always said!!!! Refreshments served and sampling is a MUST!!! And as with all our classes, you will take something home with you!! !